Claude Chabrol's taste for examining provincial France constantly creates intriguing, often intelligent films that offer a chance for reflection by the viewer. The Color of Lies (Au coeur du mensonge) sets its events in a grey landscape, removed from kinetic urban activity. An emotionally removed artist, René Sterne (Jacques Gamblin), makes a living by teaching local youths to draw. One particular pupil, an adorably cute girl, leaves his home and is later found dead in the woods. The police determine that she not only was murdered, but raped. The only logical suspect in the mind of Inspector Lesage (Valeria Bruni Tedeschi), is René. It's a preposterous notion, at least that's what those close to the artist claim. Unfortunately for René and his wife, Viviane (Sandrine Bonnaire), not all in their community feel comfortable around him. Parents begin to cancel their children's visits to him and Lesage continues her investigation with incessant fortitude. René begins to loathe himself, causing Viviane to confide in their neighbor, the supercilious G.R. Desmot (Antoine de Caunes). Desmot sees the attractive Viviane as another notch on his belt, while Viviane flirts with the notion of committing adultery in order to make human contact. What happens next goes deep into the characters' souls, bringing out their true personalities, even as they lie to each other and themselves. The storytelling is opaque, perhaps too much so for most audience members. I preferred this approach, for it avoids falling into familiar territory and can hardly be looked at as a murder mystery. Admittedly, Chabrol's direction does meander during the middle of the film, which could cause some viewers to lose interest. However, when he regains his focus in the third act, it is worth the flaws that proceed it. Bringing his aesthetic preferences for tame filmmaking to the table, Chabrol creates an atmospheric tale that is more character-driven than anything else. The plight of René is acutely realized by Jacques Gamblin, who gives a truly impressive performance. Pay close attention to the scene in the bus station, watching his ability to convey emotion through subtle physical postures. Sandrine Bonnaire also gives a convincing performance as the loving, distraught Viviane. Rounding out the principal characters, Antoine de Caunes and Valeria Bruni Tedeschi turn in intelligent performances that aid in conveying the struggle of the . Excluding the second act, this is a taut and compelling drama. Fascinated by the effects of lies on society and relationships, The Color of Lies takes us to a world that is all too real. Image Transfer Review: The anamorphic 1.66:1 widescreen transfer is fairly washed out from a color standpoint, but this seems to reflect the cinematography. Depth and detail are impressive, with some noteworthy contrast. Skin tones are accurate and there's very little in the way of noticeable flaws. Audio Transfer Review: The Dolby Stereo 2.0 mix is fairly front heavy, but playing it in ProLogic helps give it a bit more dynamic range. Sound separation opens up the front sound stage, though there's very little here to get excited about. Extras Review: The documentary Moteur, Action, Indiscrétions: A Making of Documentary on The Color of Lies (24m:42s) contains interviews with director Claude Chabrol and the cast. Sometimes the English subtitles are difficult to ready because they blend into the picture, but the material here is rather interesting. Chabrol discusses his intentions and there are multiple clips from the set, showing the shoot as well as rehearsals and makeup sessions. It isn't anything extraordinary, but it's a nice supplement. There's also a featurette, A Presentation by Film Scholar Joel Magny (02m:26s), that shows still shots from the movie with Magny's narration is largely irrelevant because the subtitles move across the screen far too fast for anybody to read without pausing the DVD (or, perhaps I'm just a dimwit who can't read). He talks about the movie in the context of Chabrol's career, though it is so brief that truly nothing major is mentioned here. The original French trailer is also provided in 1.66:1 widescreen, but there are no English subtitles to translate the audio. 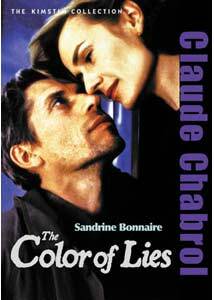 The Color of Lies (Au coeur du mensonge) is an intelligent, insightful drama from Claude Chabrol. Featuring solid audio and image transfers, this DVD is rounded out with the inclusion of a nice documentary extra.